Texas de Brazil is a chain all you can eat Brazillian-style churrascaria. If you aren't familiar with a churrascaria, basically it is an all you can eat restaurant with a very large seafood/salad bar where a series of men come to your table to carve you a variety of meats such as lamb, filet, roast, chicken etc. Your table comes equipped with a little reverse red and green coaster. If you turn the coaster to red, the nice men with their meat will leave you alone. Keep it on green, you will be inundated with meat in your face. I've only done churrascaria style eating twice, but I've noticed that the lower quality cuts of meat come around more often than the very nice cuts. Feel free to keep that coaster green but turn the nice man away. It can get annoying, but it is the only way to make sure you get to sample everything without getting too full. I have never done the churrascaria style dining at Texas de Brazil. 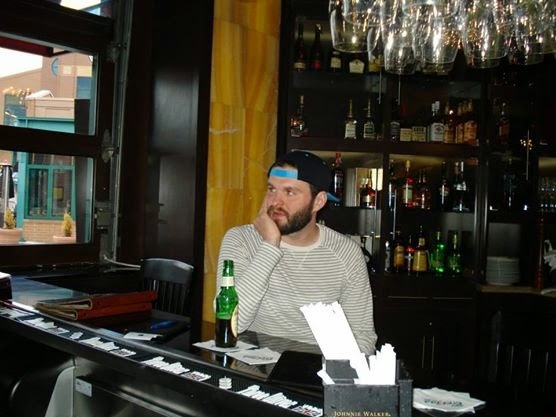 However, I've stopped by their weekly happy hour three times. From 4:00 - 7:00 you can get half priced small meat plates and $3 beers. The small meat plates come in different combinations, but you basically have your choice of sausage, a lamb chop, bacon wrapped chicken, filet and sirloin roast. This may not look pretty, but these plates are a pretty good deal. For between $4 and $8 you can have one of these nice little meat plates and a delicious basket of cheese bread. If you eat all of the cheese bread they'll even bring you more! I know because it happened to one of my fat friends once. I absolutely love the chimichurri sauce. It is great for dipping your meat as well as your cheese bread. Chimichurri sauce is a simple combination of: parsley, garlic, olive oil, oregano and some other various seasonings. If you look at my meat plate you'll also notice that they gave me a very healthy serving of green jelly. Ever since I was a small lad I can remember my father serving lamb with green jelly. This has never made any sense to me and I actually think it is disgusting and does nothing to compliment the flavor of the lamb. 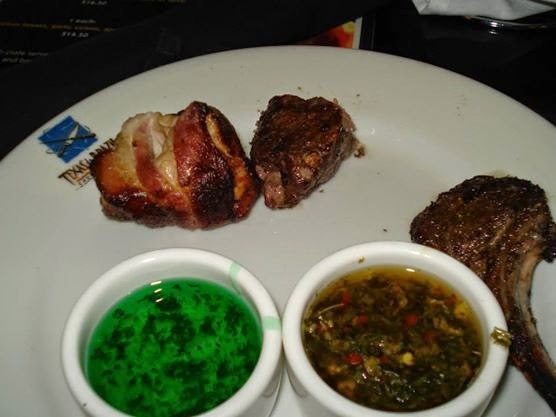 I've never really questioned the practice, but I find it odd that Texas de Brazil serves the green jelly as I thought the practice had largely fallen out of favor. Well, it turns out that the stupid English used to serve green mint jelly with mutton in order to disguise the taste. (Sheep's meat is called mutton after the lamb turns one year old. Mutton has a much stronger taste.) The English are dumb as hell. Can you imagine if you went to a restaurant and they served you a hamburger with green jelly because they let the meat sit out too long? No taxation without representation. Don't let those sheep grow up and down with the green jelly industry! I'd much rather spend the money and go to Green Forest.